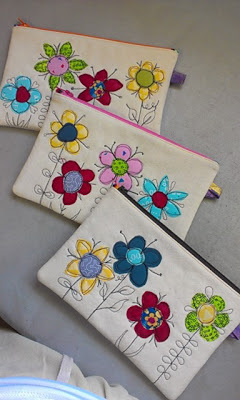 I made these three pencil cases from my scribble stitching samples earlier this week. I'm sure whom ever I give them to will love the whimsical flowers. I'm really pleased at how they came out. If I have time next week, I might try to do a few scribbly whimsical birds or chickens. Can you tell I love to do small projects? They look great Gail!! You are the QUEEN of small projects! They are really cute-well done! Grammie Camp 2013 was so much fun.